Left: Laurie Paterson, chairman of Herford Prime and Stephen Flynn from Bowmonts with the plaques for second and fourth in the Best of Brand Retail class. Right: Stephen Flynn and Kirsten Bryant during the Steak of Origin awards evening. The 2015 round of the Steak of Origin competition highlighted the consistency in performance and quality for Hereford Prime processor Bowmont Wholesale Meats. 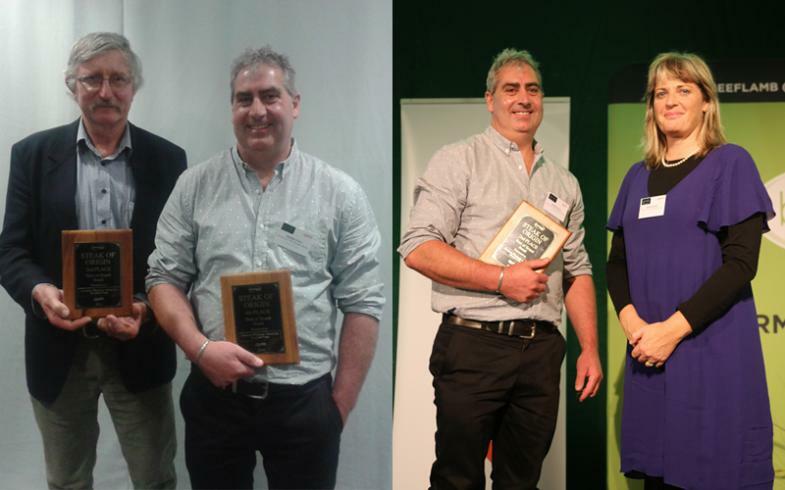 Bowmonts, Hereford Prime’s Invercargill based processing partner had 2 entries in the final of the Steak of Origin and ended up placed second and fourth in the Best of Brand Retail class. MC of the evening and acclaimed food writer Lauraine Jacobs described Bowmont’s two placings as a display of “fantastic consistency”. This consistency on the plate goes a step further as the source of the both Bowmonts entries came from one farm - Waikaka Station, near Gore. The Paterson family from Waikaka are regular suppliers to Bowmonts and Laurie Paterson is also chairman of Hereford Prime NZ Ltd.
Laurie was surprised yet pleased to see two animals sourced from their family business supporting Bowmonts. The Paterson’s literally put their money where their mouth is. “Bowmonts must be one of the most consistently performing processors in the Steak of Origin. There haven’t been that many years they’ve not been recognised on some level,” said Laurie. Bowmonts have been a processing partner of Hereford Prime since the branded beef programme was developed more than two decades ago and Laurie said he was thrilled to see Bowmonts regularly featuring in the finals of the Steak of Origin competition – having won the inaugural competition 13 years ago. Stephen Flynn from Bowmonts Wholesale Meats said he was pretty pleased with the results. “To get into the final is pretty good in itself,” he said. There were 62 entries in the Best of Brand Retail class and a total of 327 entries across the entire competition. And while it is difficult to identify the perfect steak, Stephen said he and the Bowmont team put time and effort into their selection process. They work closely with procurement agent, Robin Gamble who is tasked with sourcing quality live animals before the Bowmont team carefully look for sirloins they feel exhibit quality beef attributes, such as the meat and fat colour. Hereford Prime brand manager Natalie Campbell said it was fantastic to see Bowmonts receive two awards and receive recognition for the outstanding job they do. “The Bowmonts team are dedicated and passionate about quality beef and for them to be acknowledged with two accolades is an outstanding feat,” she said. She said it’s even more remarkable given the entered sirloins were sourced from one farm and two separate animals. “That is exceptional and highlights the unrivalled consistency that Hereford Prime beef is renowned for,” said Natalie. Congratulations are also extended to Tom Savage from Poututu Station near Gisborne for winning the Best of Breed Crossbred class with a Hereford Shorthorn cross. The Hereford Shorthorn cross is eligible for Hereford prime as it meets the requirements of being a first cross Hereford and British breed. Poututu Station was featured in 2010 edition of the NZ Herefords magazine.